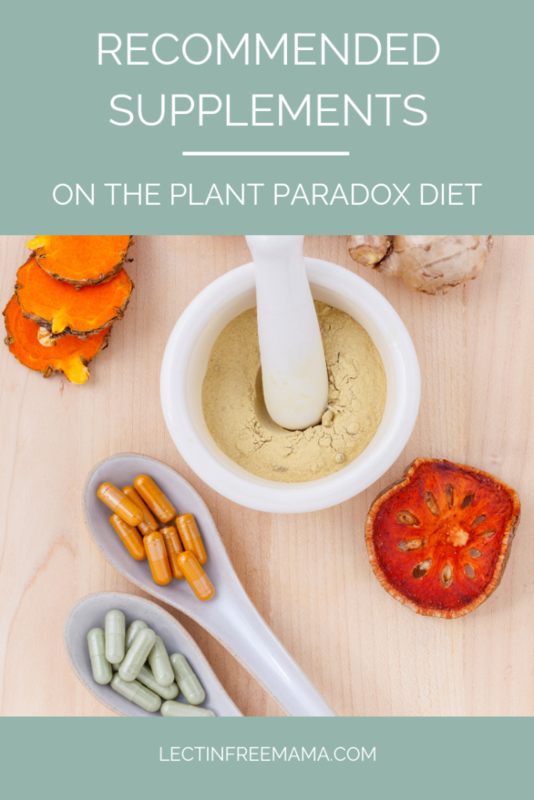 Conventional practitioners seem to have a unified message regarding supplements on the Plant Paradox diet (or any diet). The message being: they’re a waste of money. I’ll admit, I’m guilty of figuratively running in the other direction when I hear a trending TV or Internet doctor mention the word. The problem (or solution) with supplements is they aren’t treatments for symptoms. In other words, there’s no “pill for an ill.” Therefore, many doctors will say not to bother. Instead, take this [insert heavily marketed, pharmaceutical-funded clinically-proven drug]. When that particular drug causes side effects, there’s another one waiting on the next page of the prescription pad! (Allergists are notorious for this–I once walked away with prescriptions for 2 nose sprays, 4 pills, 2 creams, and 2 inhalers.) Pretty soon, you’ve got a medicine cabinet full of drugs that may be harming as much as they’re helping. But hey, at least all of your symptoms are under control (or not). This post contains affiliate links. In addition, nothing on this website is intended to recommend any particular form of medical treatment or that persons manage their own health problems without the advice of a licensed health care practitioner. Read my disclosure policy and terms & conditions for more information. Dr. Gundry used to operate this way–he had the catchphrase “supplements make expensive urine.” But then he stopped working for insurance companies. After that, he started examining blood work–lots and lots of blood work. And what he found was that the things we eat–foods, vitamins, minerals, plant compounds, and yes, supplements–have measurable effects in the body. In fact, supplements have such an effect, he can tell in the blood work when a patient switches to a different brand. 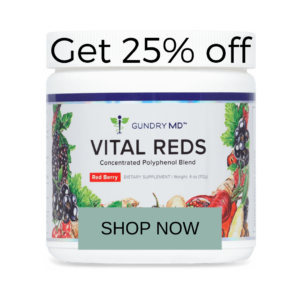 What supplements does Dr. Gundry recommend? 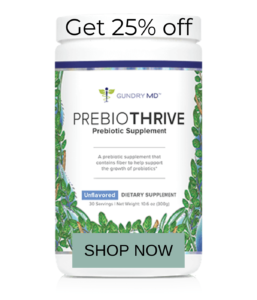 This is like the polyphenol jackpot with 34 different phenolic compounds and one of the best patented probiotic strains on the market (Bacillus coagulans). If you can afford to supplement with one thing, this is the one my readers have said makes the biggest difference–more energy, clearer skin, and less bloating. The probiotic on its own is pretty awesome–I take it separately, too (this brand). According to Dr. Gundry, our gut bugs have an insatiable appetite for leafy greens. The more we give to our good gut bugs, the more they crowd out the bad bugs. Most importantly, they give the benefits back to us in the form of good health! More is better in the case of these phytonutrients. There are a lot of green superfood blends on the market. However, all the ones I’ve seen contain grasses (lectins). Dr. Gundry’s mix combines the best lectin-free superfood greens with digestive enzymes, probiotics, and immune-boosting compounds. I alternate between a scoop of this and a scoop of Vital Reds in my green smoothies (together they are too sweet for me). Firstly, prebiotics are indigestible plant fibers that pass through the GI tract intact. Secondly, they feed the gut bugs in the large intestine. Think of them as the fertilizer for all the leafy greens you’re eating (right?). There’s a whole category of approved foods on the Plant Paradox Diet that contain these prebiotic fibers. Anecdotally, these starchier foods can be bothersome to those with SIBO, IBS, or diabetes (large amounts definitely bother me). Too many can stall weight loss or even cause weight gain. This is where one may want to supplement with small amounts of prebiotic fiber until they can tolerate more of the starchy foods (or a bigger supplemental dose). Good sources of prebiotic fiber will cause your good gut bugs to multiply. This has been known to result in more…trips to the bathroom. So, start small and work your way up to the suggested dose on the bottle/can! This one has five of the most potent prebiotic extracts. This includes inulin, flaxseed, and fructooligosaccharides (indigestible sugars). I toss this stuff into my smoothies as well. I started with a 1/4 scoop. I’m still in the process of working my way to the full scoop (I’m not in a hurry). The best part about this is it’s unflavored. Consequently, you can add it to almost anything–soup, for example. Omega-3 fatty acids (read my fat article to learn about those) are crucial for brain health. And it’s no surprise–what with the rise of fake fat–that most of us are highly deficient in it. One study showed that people who lacked these fatty acids have poorer memory and smaller brains. (6) In other words, the “low fat” diet craze of the past few decades has done more harm than good. There are several good supplemental sources of omega-3 acids with DHA. Dr. Gundry has one with rosemary extract. Personally, the Carlson’s liquid one is my favorite. I take a tablespoon a day. My 2-year-old daughter takes it too. She’s always asking for her fish oil. Whatever your source, Dr. Gundry recommends at least 1000 milligrams of DHA per day. 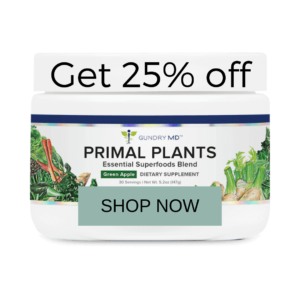 The list of recommended supplements on the Plant Paradox diet overwhelmed me in the beginning. Therefore, I started this protocol by taking exactly none of them. I’m glad I did. It was a slower process, but it gave me a chance to test the waters with a new way of eating before adding in supplemental support. Now that I’m well on my way to healing, I’ve incorporated many of Dr. Gundry’s suggestions. Similarly, I’ve also included suggestions from my own functional medicine practitioner. They have helped tremendously. In short, there’s no one way to supplement. Make the recommendations work for your overall health plan and you’ll be well on your way to success with the Plant Paradox lifestyle. Is there a gluten-free multi vitamin? I only have extreme gluten and lectin sensitivity, not any other ailments. Im thinking my Trader Joes vitamins may be causing havoc…..
Also I want to start making almond meal pasta, got any ideas for that? I really haven’t read a lot on multivitamins–there are so many of them out there, it’s a little overwhelming for me. Do you work with a functional practitioner? That would be my recommendation–is to get a recommendation from him or her. As far as almond meal pasta–are you in the Plant Paradox By the Books Recipe Sharing group on Facebook? There are a couple recipes in that group for grain-free pastas, using almond and cassava flours. Delicious! Thanks Autumn,,,that makes it so easy ! I’m going to change it up a bit after reading this! I was lead to believe that the 90% & 99%Lindt bars are Dutch processed, so I stayed at 85%, do you know different? They may be, but they are still my favorite! The keto intensive folks are not allowed anything under 90%, so unfortunately the 85% is out. Dr. G has recommended the Lindt, so I’ve stuck with that and Ghirardelli.